Holy half helmet Batman! Scorpion is introducing the new Scorpion Covert Ratnik Helmet and this lid is on a mission to be one of the most versatile half helmets you can put your paws on! If you are looking the swiss army knife of half helmets, then look no further. This lid comes equipped with a SpeedView internal sun visor that has a EverClear no fog coating, an aero-tuned ventilation system, polycarbonate shell, and a Kwikwick 2 anti-microbial fabric liner. What’s that, there's more? Of course there is! Maybe you ride into some inclement weather or perhaps the bugs simply have it out for you that day, the Covert Ratnik Phantom comes equipped with a neodymium magnetically attached front mask. While I am a strong supporter of riding down the highway with your mouth wide open, I certainly understand it is not for everyone. Come on, who doesn’t like some free protein? The front mask is easily removable and will quickly turn this half helmet into a 3 quarter bug shield in no time at all. 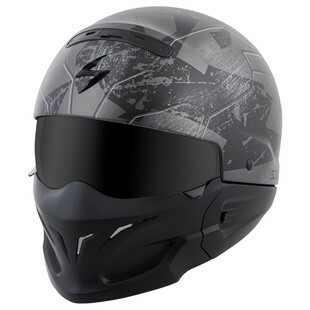 Overall this helmet is going to be a very versatile piece of equipment providing quality features that will have you covered no matter where the open road might take you.